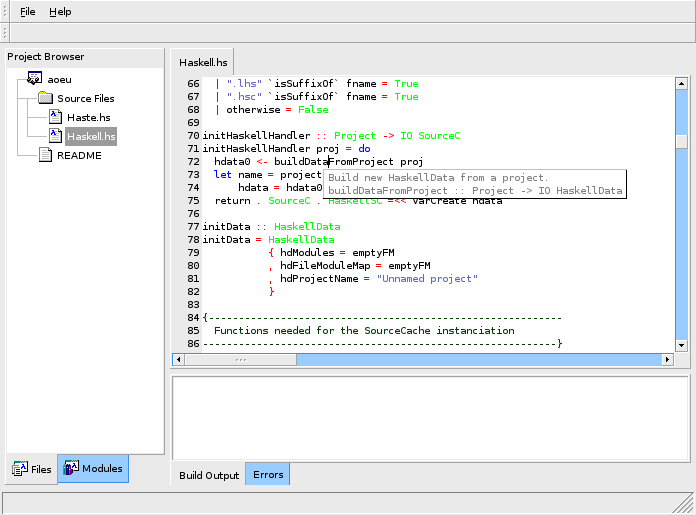 Haste, short for Haskell Turbo-Edit was a Haskell IDE written in Haskell which used Wxhaskell as a GUI and a heavily modified version of haddock 1.x for Intellisense (tab-completion). It was announced Sun Apr 10 2005, by a group of students at Chalmers University. The development of Haste has been abandoned, and as of GHC 6.8.2, it is somewhat bitrotten. A snapshot of the last sources can be found at d3proj.tar.bz2. had some integration with darcs, haddock2 (?) and a proper source code widget. It was based on using IO much, and we discussed it and were eager to try a more pure style, like xmonad to the X server. We would probably rewrite it pretty much from scratch if we'd continue. The current work is all done by Waern. A screenshot of Haste circa January 2006. This page was last modified on 10 October 2013, at 05:54.